This year’s UN climate talks, COP24, wrapped up late on Saturday night in Katowice, Poland. They were supposed to agree the operating manual for the ‘Paris Agreement’, the global deal signed at COP21 in 2015. 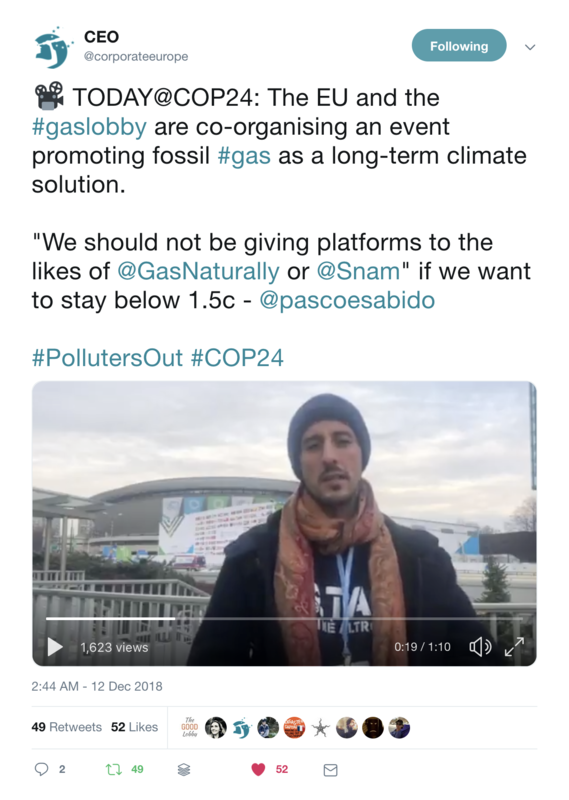 However the ‘Paris Rulebook’ agreed in Katowice represents a step backwards for climate justice, thanks to the influence of big polluters, particularly the gas industry. There was no increased ambition in emissions reductions, while rich industrialised countries wriggled out of their commitment to pay poorer countries to help them deal with the climate mess created by Western nations. Corporate-friendly carbon markets also featured heavily in discussions, pushed by the world's most polluting industries. Like at COP19, also held in Poland, fossil fuel industry influence dominated this year also. Coal garnered much media attention, thanks to the Polish Government and US President Trump’s support. But it was the gas industry that really stunk up the conference, its influence seeping into all corners of the negotiating halls. Luckily activists and communities were present to call industry out and demand real solutions. But the question remains: should the very corporations who caused the climate crisis be allowed to shape how we solve it? 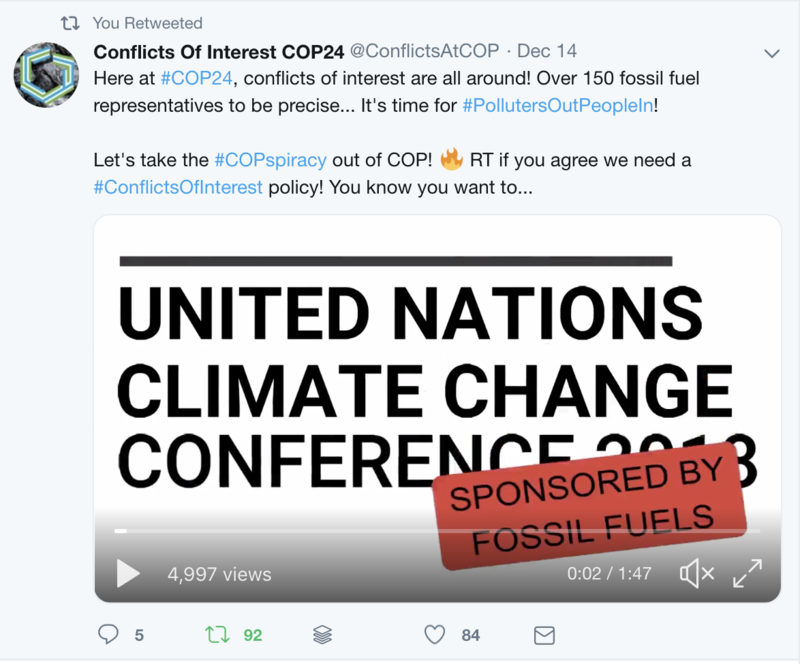 Many countries promoted their anti-coal credentials at COP24, including the EU and UK. However, both want to shift their dependency from one fossil fuel, coal, to another, gas. Despite industry hype, fossil gas is no climate solution. It is primarily made of methane, a greenhouse gas 100 times worse than carbon dioxide (CO2) over a ten year period. The use of fossil gas results in large quantities of methane leaking into the atmosphere, making it as bad for the climate as coal, if not worse. Not to mention the destruction to communities, their health and their environments up and down gas supply-chains. To call out the greenwashing and highlight that gas stinks as much as coal, Corporate Europe Observatory, alongside allies like the gastivists, UKYCC, Friends of the Earth International and SustainUS, led a ‘toxic tour’ around various country ‘pavilions’, hearing from speakers fighting gas projects in those countries. 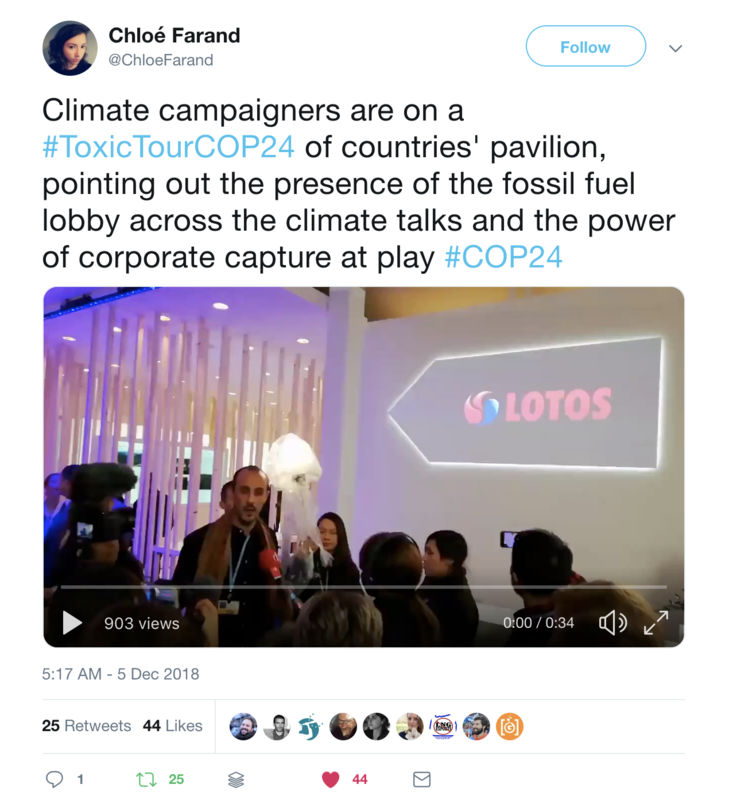 Check out #ToxicTourCOP24 to see clips of more stops along the tour. 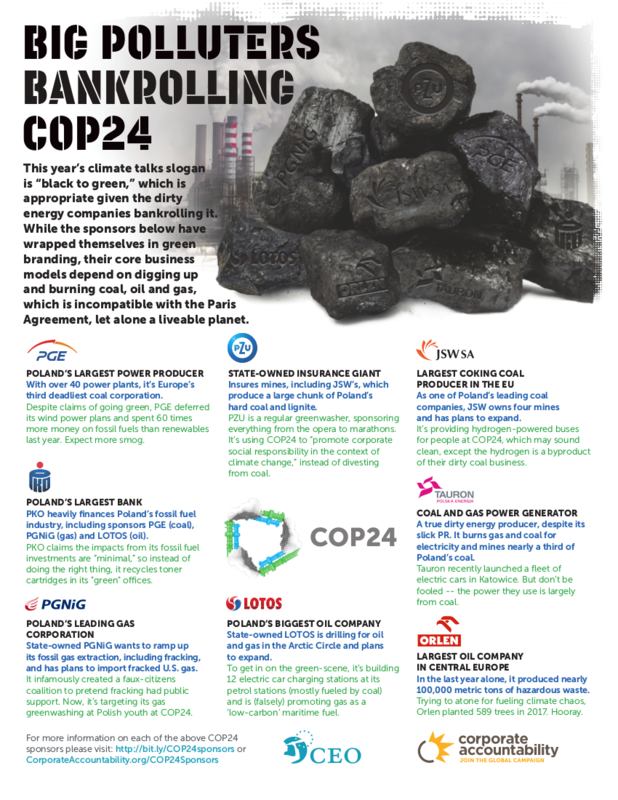 Bizarrely, the Polish Presidency invited four coal and two oil companies to sponsor the climate talks. Madness! It also invited gas giant PGNiG, who provided ‘eco’ buses powered by compressed natural gas (CNG) to transport COP24 delegates. However research shows that gas-powered buses are as bad for the climate and air quality as petrol and diesel. 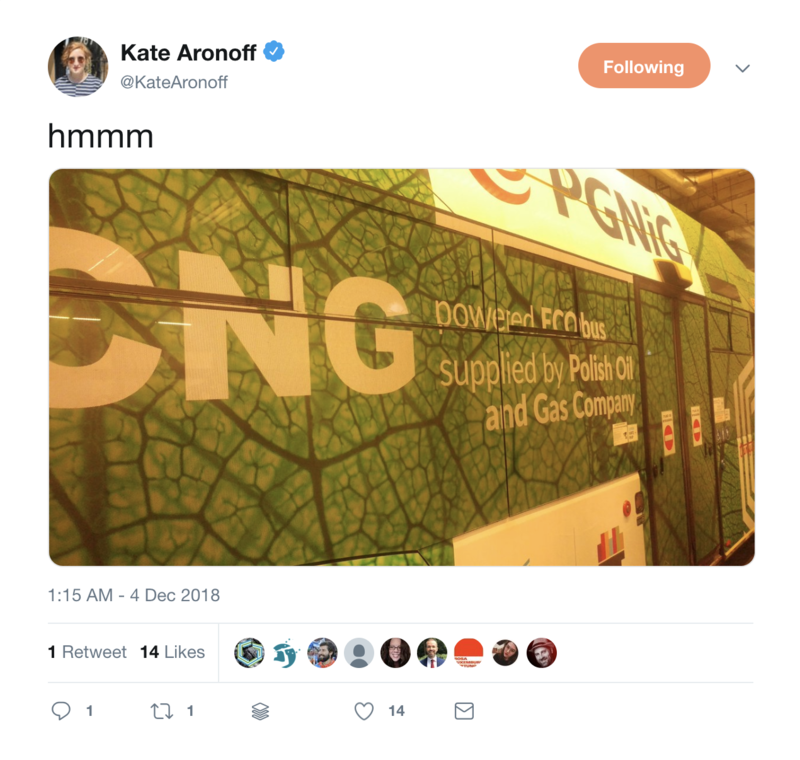 Not only did PGNiG promote its buses, it also organised events in the Polish pavilion to promote the destructive practice of ‘fracking’ to extract gas. The company wants to start domestic production (a long term lobbying target), and has just signed a deal to import fracked gas from the US. To increase acceptance of fossil gas in Poland, it is working with the Ministry of Education to create a pro-gas curriculum for children replete with comics, video games and a science quiz. The EU wanted to use COP24 to promote its climate leadership credentials. The week before the talks started it launched its new 2050 climate strategy, which aims to keep temperature rise below 1.5o C as outlined in the Paris Agreement. However, a deeper look shows a continued reliance on gas, including replacing fossil gas with so-called ‘renewable gas’ made from organic waste or excess renewable electricity. But independent studies show there will be so little renewable gas by 2050 that the EU will instead just keep using fossil gas and all the problems it poses for the climate, communities and their environments. Gas – fossil and renewable – is a dangerous distraction being pushed by a very influential gas lobby (see our latest myth buster on renewable gas and the lobby behind it). 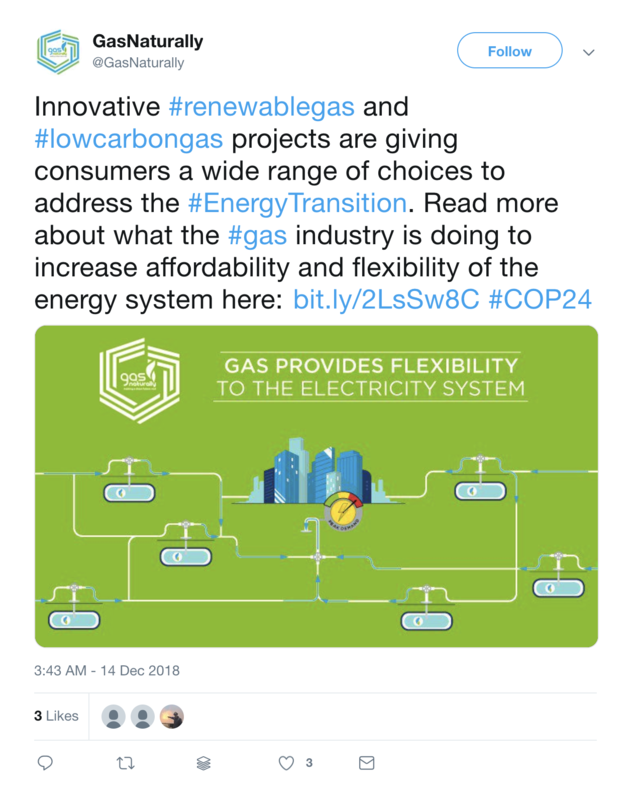 The EU hosted an event at COP24 with Brussels lobby giant GasNaturally, explaining how gas would help meet the world’s 2050 targets. It was followed by a cocktail reception. The keynote speaker Marco Alverà is President of GasNaturally and CEO of Snam, the Italian gas pipeline company behind the controversial Trans-Adriatic mega Pipeline (TAP). If completed, the pipeline will bring Azeri gas to Europe, but it is being heavily resisted by local communities. Activists and communities fighting new gas infrastructure staged a walkout of the event as Alverà began to speak, instead holding their own event outside. 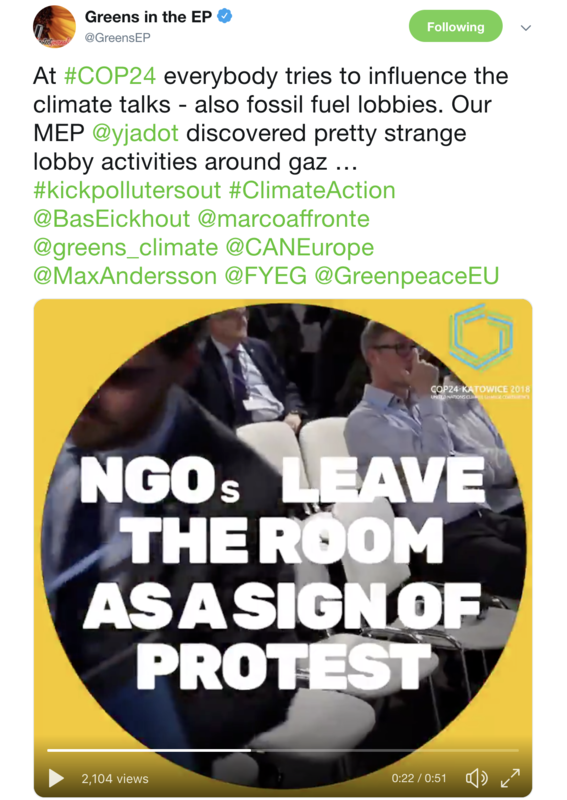 As they shared stories of the impacts of gas and the resistance, back in the European Parliament in Strasbourg, the majority of MEPs voted to keep spending public funds on fossil gas projects. So much for climate leadership. 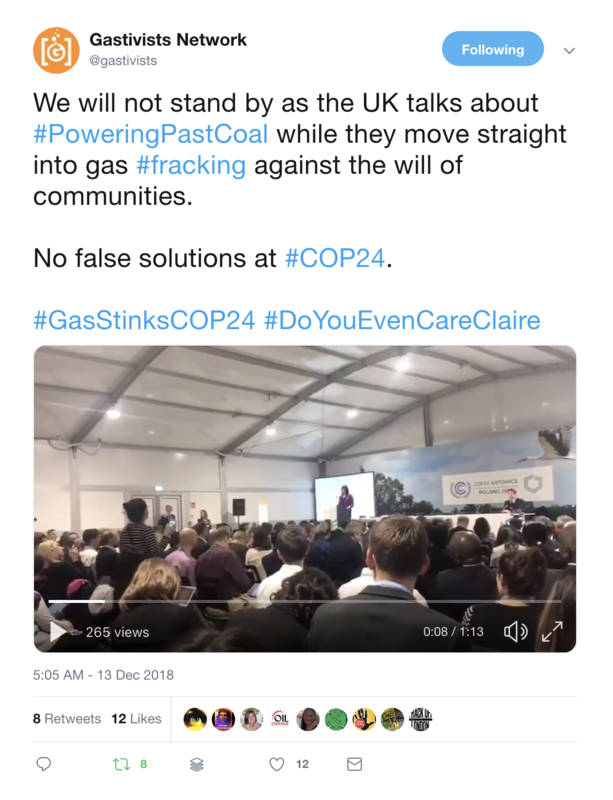 The UK wanted to use COP24 to promote its ‘powering past coal’ coalition and new marketing slogan, ‘Green is Great’, which was plastered all over its pavilion. What they didn’t want people to talk about was the UK changing its planning laws to make gas fracking even easier, as well as jailing anti-fracking activists (the sentence was eventually quashed). 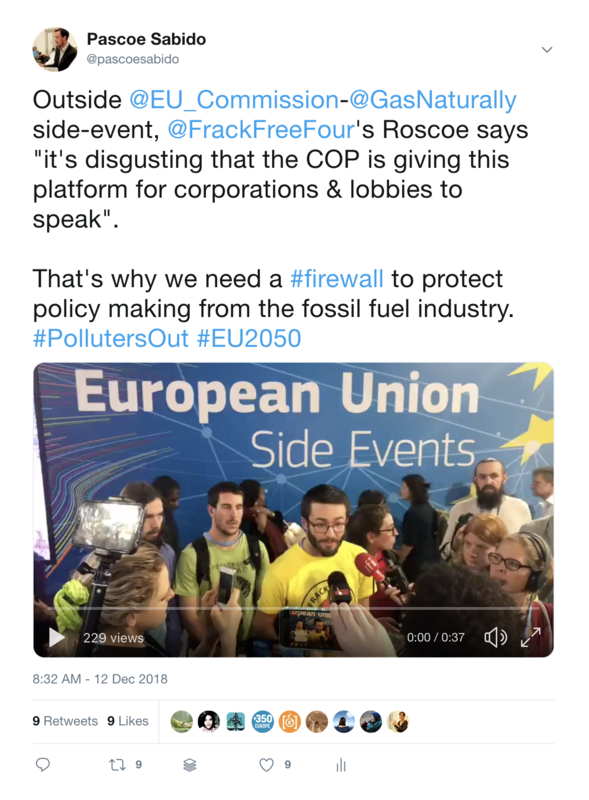 Luckily the gastivists, UKYCC and others were on hand to point this out at a public event featuring UK Energy Minister Claire Perry, a vocal supporter of fracking. One of the biggest fights was over new carbon markets, a proposal not just pushed but also written by the gas industry. David Hone, a Shell executive, boasted during a public event that his company, alongside other fossil industry giants, worked for the past four years to ensure carbon markets were part of the Paris Agreement. The decision on how to include them in the Rulebook was ultimately delayed to next year’s COP25, but the fingerprints of the gas industry are all over it. The companies most responsible for climate change are now instrumental in shaping the solutions, despite the glaring conflict of interest. Shell and its climate and community-destroying activities were also targeted by protesters in Katowice (see video below). COP24 fell far short of delivering what the world needs to keep the temperature rise to 1.5oC. No wonder, when the power of the fossil fuel industry – including gas – is so omnipresent. Not just at international talks, but in our national capitals too. We cannot achieve the necessary ambition without ending their grip over policy making. 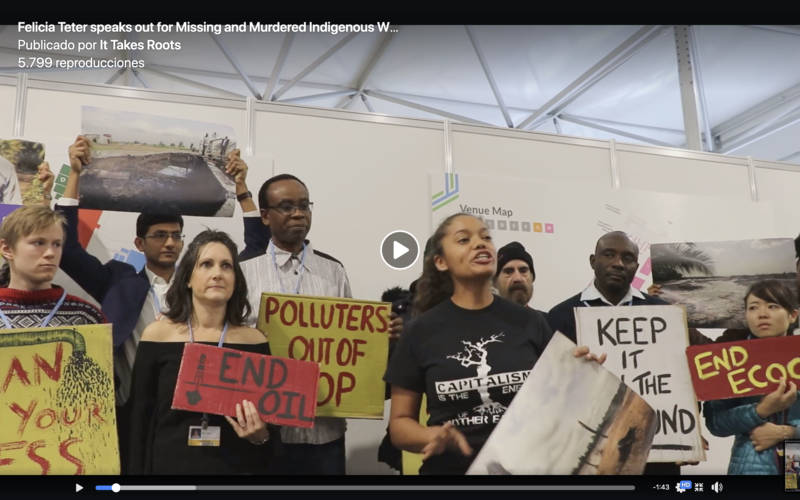 Many climate justice groups have called for the fossil fuel industry to be kicked out of the UN climate talks, introducing a firewall between polluters and public officials. Doing so would also encompass policy making in Brussels and EU capitals. A similar firewall was introduced by the World Health Organisation to protect public health policy from the tobacco lobby, and it’s time we took the same steps to protect climate policy-making. 2019 will be a crucial year in the EU, as the 2050 climate strategy is debated and finalised. It offers a chance to ensure that the same corporations who caused the climate crisis are not in charge of designing a way out that puts their profits before people and the planet. The only way to kick the stink of gas hanging over climate politics is to kick industry out.